Samsung’s upcoming 2019 Galaxy S10 flagship smartphones have been making headlines since the months now and many concepts have surfaced online which assure that ‘this’ is what the phone would look like and ‘these’ are the features it will have. But keeping all those concepts and theories aside the Galaxy S10 may be the best smartphone of 2019 because the South Korean technology giant is making sure to put all top-notch features in its upcoming flagship smartphone. Needless to say, people are excited about the tenth iteration of the Galaxy S series getting launched. Even before the smartphones have been launched, it is being speculated that they will make it on the list of best smartphones of 2019.Samsung Galaxy S10 lineup is scheduled to be launched at the company’s Unpacked event that will be held in San Francisco on February 20. And now, a new leak has surfaced online according to which, Samsung will also be launching Galaxy Buds which will compete directly with Apple’s Airpods. These are seen as Samsung Gear Icon X wireless earbud’s upgrade. The leaked render of the earphones that was first shared by technology website WinFuture shows us what to expect. 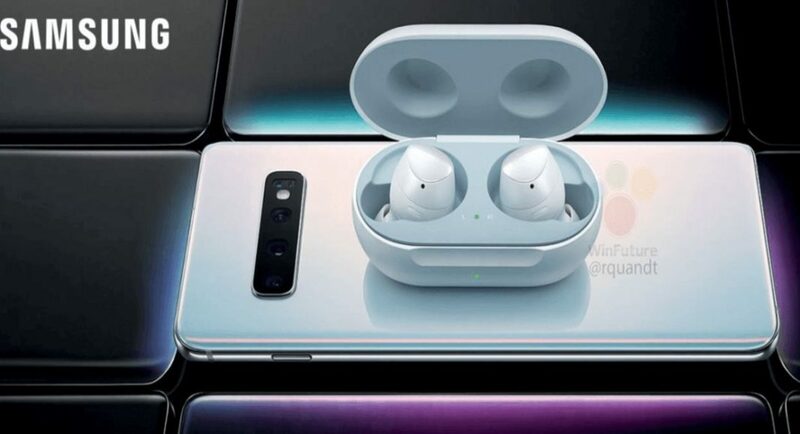 The leaked image shows the Galaxy Buds in their case which is placed on top of Galaxy S10. On closer look it can be seen that a green charging indicator on the Bud’s case it lit in the image, which confirms that the Galaxy Buds is charging. This confirms that the Buds will come with wireless charging and also that the Samsung Galaxy S10 will come with reverse wireless charging which earlier was seen on the Huawei Mate 20 Pro. Reverse wireless charging is a feature which lets the user charge a device which supports wireless charging by placing it on the back panel of Samsung Galaxy S10. The wireless earphones are not shown in their full view, we can only see the Galaxy Buds from a certain angle, but it can be seen that they will not have the large wings on them like the Gear Icon X had. It is not known how the earphones will be able to stay inside the ear without falling off without the wings. Having said that, we should mention that Apple’s Airpods does a fine job of staying inside the ear, so Samsung will have to ensure that its Galaxy Buds are able to do it too. Samsung Galaxy Buds are expected to be priced at $169 (approximately Rs 12,000) and they are expected to be launched alongside the Galaxy S10 smartphone during the Galaxy Unpacked event.